If along with LED / CFL lamps, you need to drive DC loads like music system, TV, Fans etc., this system comes handy as you do not need inverter. Our 10A solar charge controller, McH10Si is ideal unit for the same. Housing unit with one 3W LED lamp and two remote 3W LED lamps with long leads to be put at different locations of a house. Solar Home Lighting Systems are the fixed installations designed for domestic application. 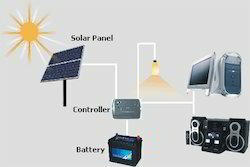 The components of the solar lighting system includes solar pv module (solar cells), charge controller, solar battery and lighting system (lamps & fans).